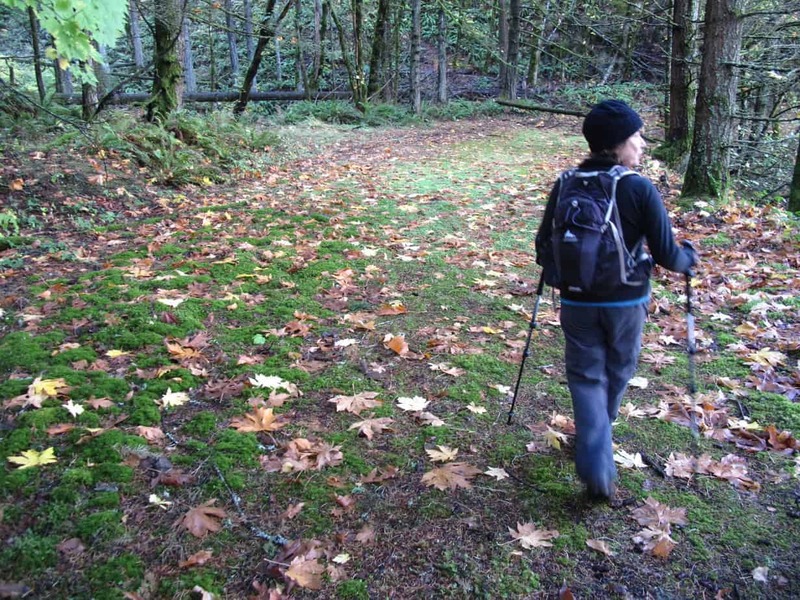 It’s that time of year again when the temperatures drop, the leaves turn, and we start thinking about the best fall colors hikes near Portland. It’s also the time of year when, every year, I remember that October is actually my favorite hiking month of the year: cool air, clear days, no bugs, few people, and that special energy of getting it done while you still can. The leaves are falling, so bundle up and let’s hike! 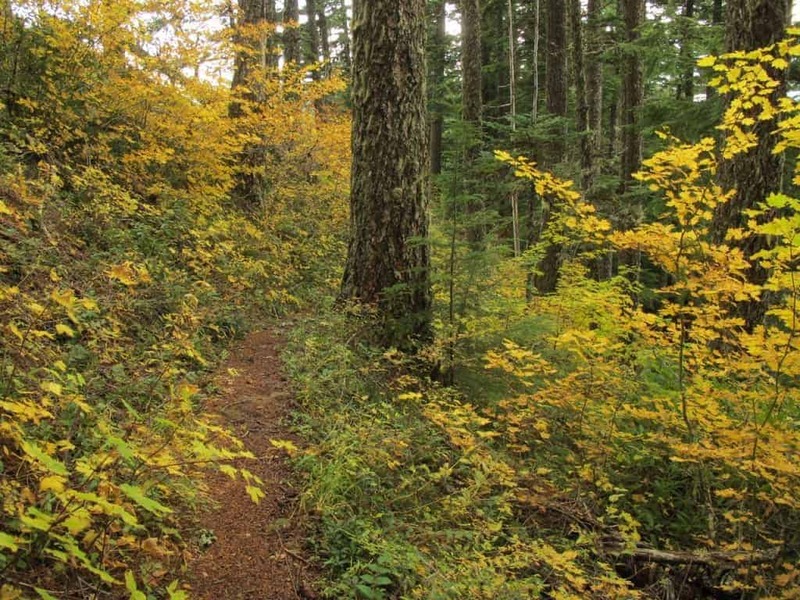 Obviously, the best fall colors hikes will be the best forest hikes. 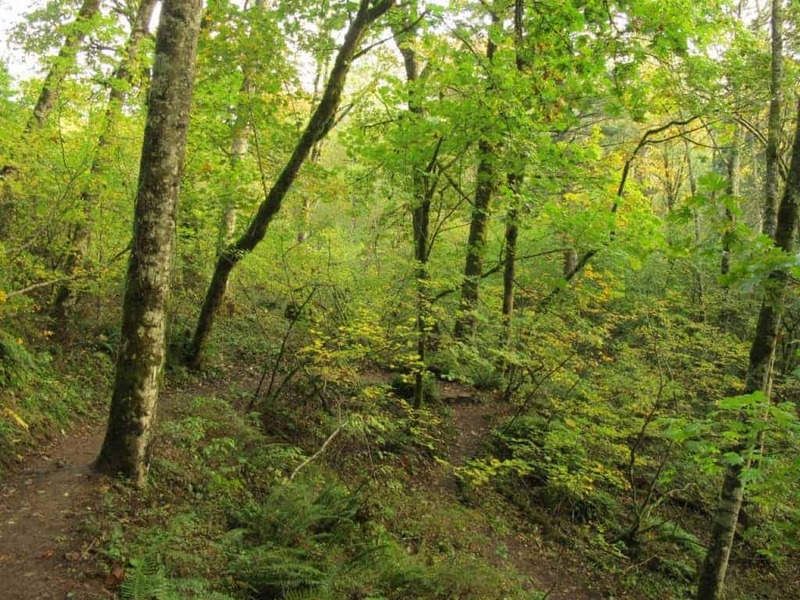 But not just any forest will do; in my opinion, the best fall colors hikes near Portland are in the older forests, where vine maples tend to dominate, or in lower-elevation forests with bigleaf maples. For these, you’d want to go to the Gorge or the valley. Some of the best fall colors are actually right in town. This is, by no means, the definitive list. I’d love to get your comments and suggestions below or via email. But here’s a good variety of hikes near (or in) Portland where you can be assured to see fall colors in all their glory. And by the way, all of these are in my book, 60 Hikes Within 60 Miles of Portland. Get your signed copy of the new 5th edition of 60 Hikes here. The views of Mount Saint Helens from Ape Canyon Trail are sublime. You can go as far up as you like on this rolling, gently uphill hike. 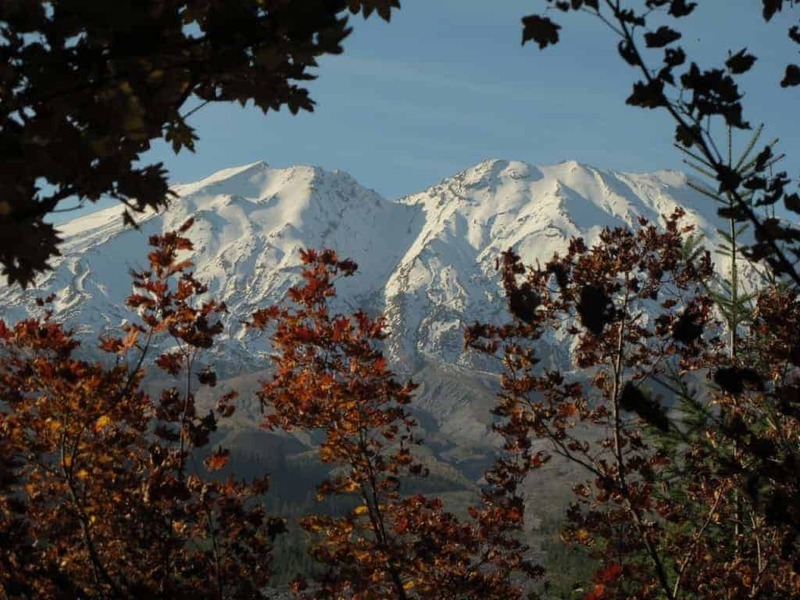 If you put in the full 4.6 miles to Ape Canyon you’ll be up out of the trees, and another half mile brings you to the dramatic Plains of Abraham, with sweeping views of Mount Saint Helens. 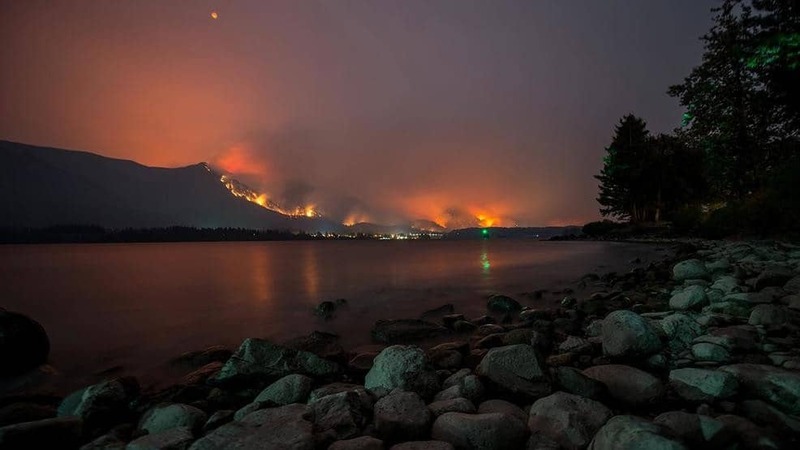 Where: Columbia River Gorge. Driving distance from Portland: About 30 miles. Permit? None. Length: 6.3 miles for the whole loop. Difficulty: Moderate. Best time for colors: Mid-October. Read my detailed report from Cape Horn here. This is really two hikes put together: An upper loop of either 2.6 or 5.2 miles to viewpoints above the river, or a lower loop of about 4 miles that skirts the edge of cliffs just above the river and visits a waterfall. At fall colors time, you can do the whole thing in a 6.3-mile loop, and that’s what I recommend. 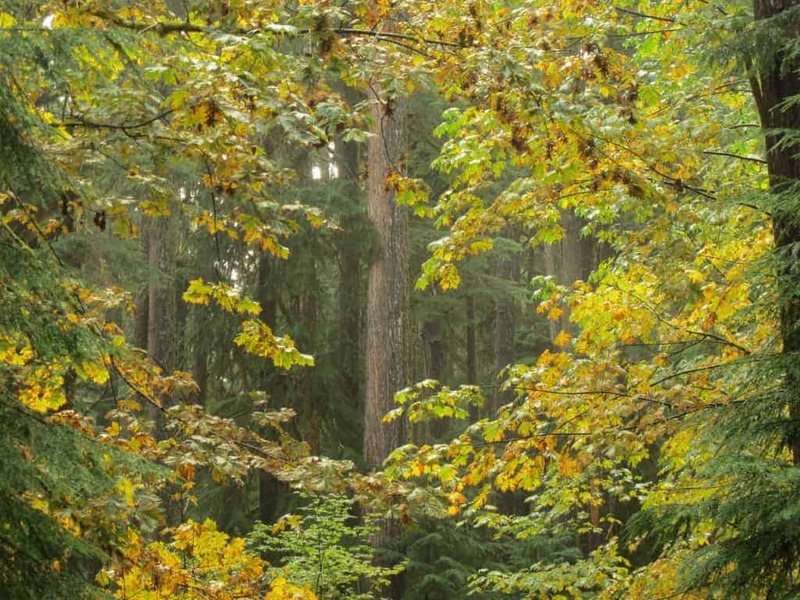 You start by climbing through a younger forest where the bigleaf maples offer spectacular golden colors, and occasional views of the Columbia are fantastic. 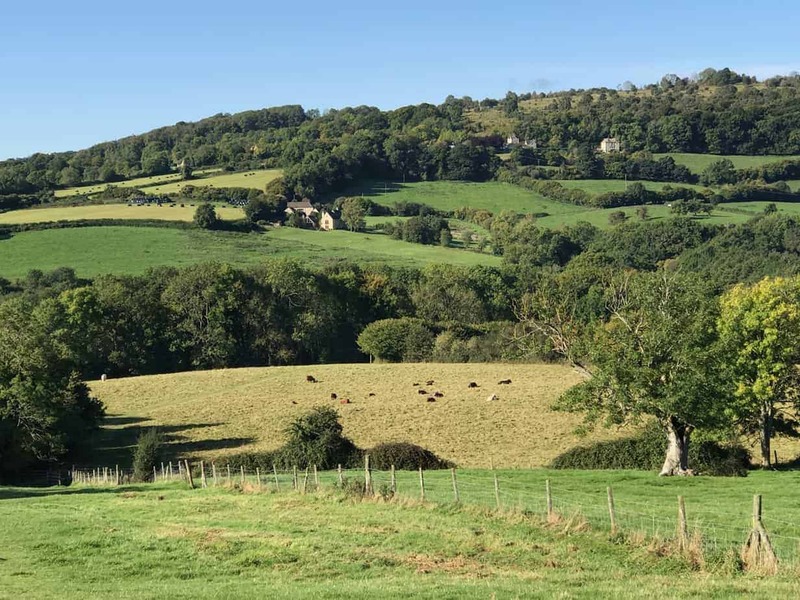 The middle section may remind you of a country-road amble, past farms and fields and hillsides splashed with fall colors. The lower portion of the hike is similar forest to the upper, but the views of the river are much more dramatic, as you’re on top of 250-foot cliffs right above the river and a railroad tunnel. The best fall colors are probably along the Maple Trail. 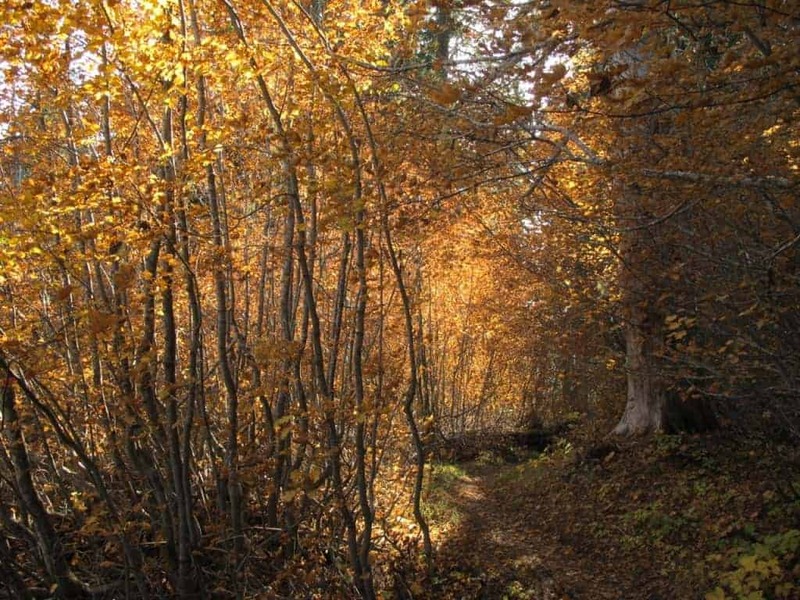 Also look for the American Smoke Trees along Hawthorn and Walnut Trails, the Japanese Larch on Redwood Trail, Green Ash on the Overlook Trail, and Witch Hazel on Wildwood Trail. You can get a full trail map at the Visitor Center (or online here). 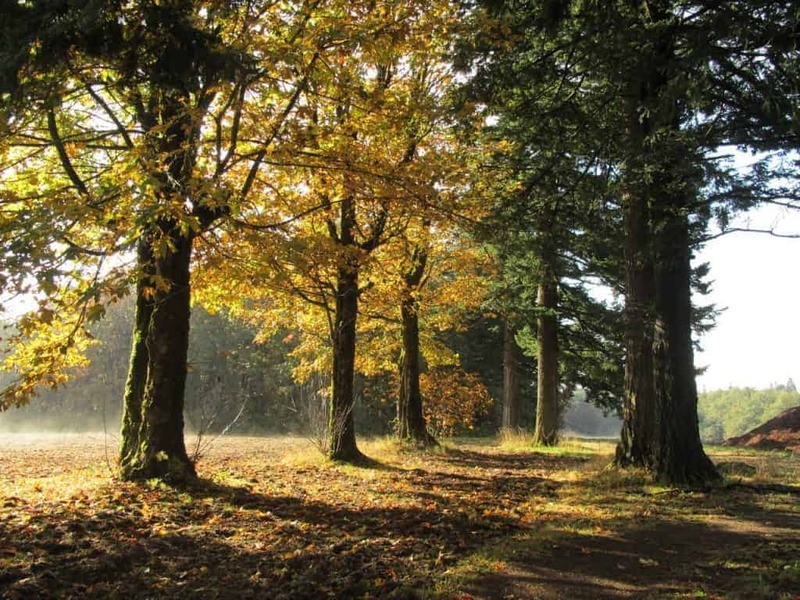 You can also join the Hoyt Arboretum Friends and go on a guided fall colors hike November 3. 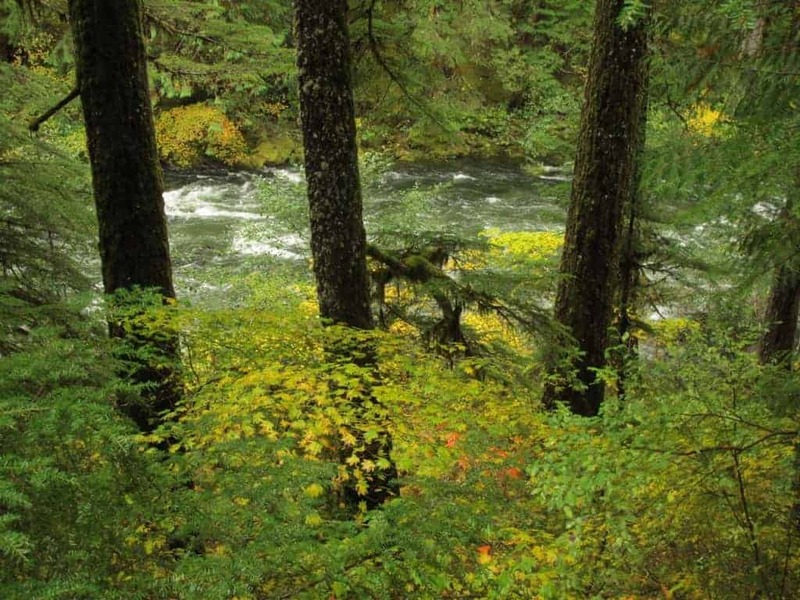 Big old trees, fall colors, and clear mountain stream: The essence of Opal Creek Wilderness. For hikers, this means easy access to a wonderland forest. Walk just a mile and a half down a former road, and you’re surrounded by massive firs and cedars, interspersed with maples, other fall colors, and creeks. Go at least seven miles to Opal Pool, and make a loop via the Opal Creek Trail, coming back through Jawbone Flats. Or sign up for one of their workshops, including two mushroom workshops each October. I took this one from a campsite on the Salmon River Trail. Where: Near Welches on Highway 26 in the Mount Hood National Forest. Driving distance from Portland: About 50 miles. Permit? NW Forest Pass. Length: Anything up to 6.6 miles. Difficulty: Easy; moderate if you go up the hill. Best time for colors: October. Online Info and photo album from my Facebook page. As if amazing fall colors weren’t enough, along the Salmon River in October you also stand an excellent chance of seeing spawning salmon. There’s something truly magical about sitting in autumnal splendor along a clear mountain stream surrounded by ancient forest, watching fish that have spent their lives in the ocean and swum some 75 miles up the Columbia River, about 41 miles up the Sandy, then about 20 miles up the Salmon. There can be much peace and quiet along the Salmon. There are a series of trailheads along the Salmon River Road, so just pick one and go for it. This is a great hike for kids, too. The trail section below the bridge is 2.6 miles long, and above that is a two-mile flat section along the river, beyond which is a 1.3-mile climb of 600 feet to a spectacular canyon lookout. South Falls, 177 feet high and very near the historic lodge. 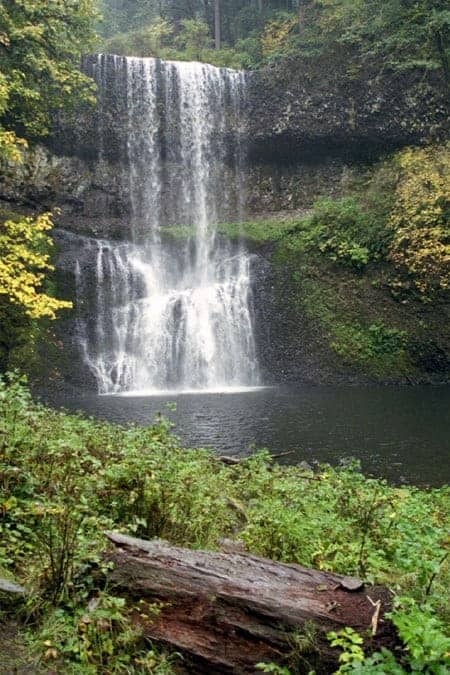 Silver Falls State Park will certainly wow you with fall colors. But if it’s waterfalls you’re after—especially the chance to get behind them—this is the hike of your dreams. 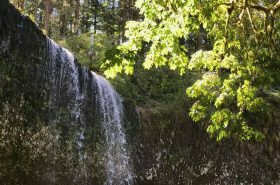 It’s an easy 7-mile loop that’s known as Trail of Ten Falls. There are also shorter loops available, all of which take in views of one or more waterfalls. Be sure to visit South Falls Lodge, 0.1 mile from the parking lot. It was built of native stone and wood by the Civilian Conservation Corps (CCC) in 1941. Warm yourself by two massive fireplaces, enjoy photos of the park and some of the tools used by the CCC, and take advantage of that most modern of conveniences: a snack bar with an espresso stand. 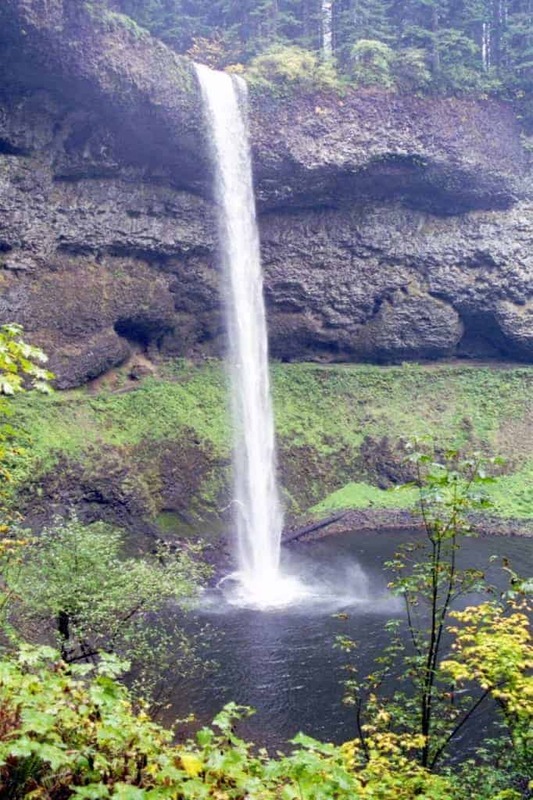 It’s just a short walk from there to 177-foot South Falls and the start of the trail. Note: Dogs are not allowed on this one. Siouxon Creek Trail in October. 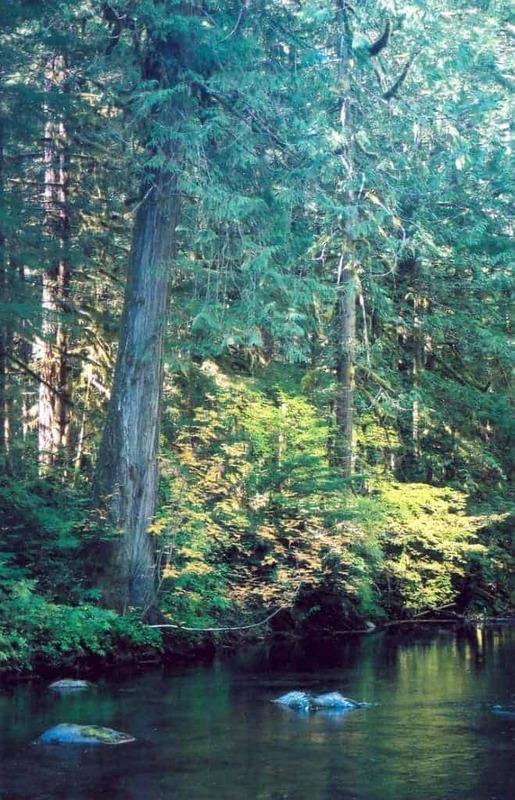 This is an easy, pleasant stroll along a mountain stream, with old-growth forest and waterfalls all around, plus longer options that include a stream crossing and rugged climbing. There are even excellent, easy-to-reach backpacking campistes. What more could you want? The fall colors here come, again, from all that an old forest has to offer: a variety of trees reflected in the clear waters of a beautiful stream. The trail is four miles along the creek, passing side streams and waterfalls all along the way. 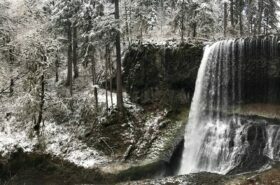 See if you can make it all the way to 50-foot Chinook Falls, some 4 miles up. This is like a secret hike. Most people have never heard of it, but everybody who goes there loves it. It’s quiet and woodsy, with lots of creeks, two waterfalls, great campsites, and—if you want some elevation—a great view from Observation Peak. The simplest thing to do here is just start into the woods and hike up the trail until you’ve had enough. Almost right away, you’ll enter the old forest and be amazed such a lovely wilderness is so close to Portland. You can go all the way up to Observation Peak, if you’re looking for a massive workout, but for the best fall colors you don’t have to work anywhere near that hard. 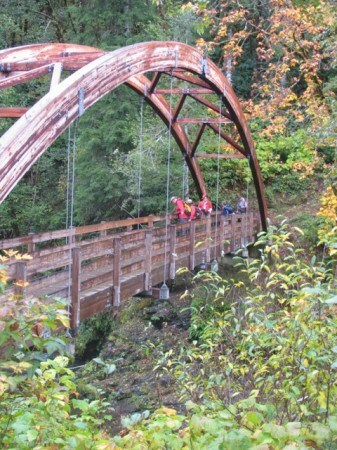 Footbridge over a fork of the Wilson River. 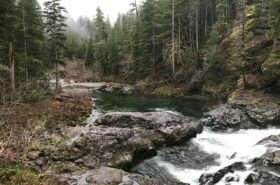 This relatively new trail explores the canyon of the Wilson River, where salmon and steelhead come to spawn. 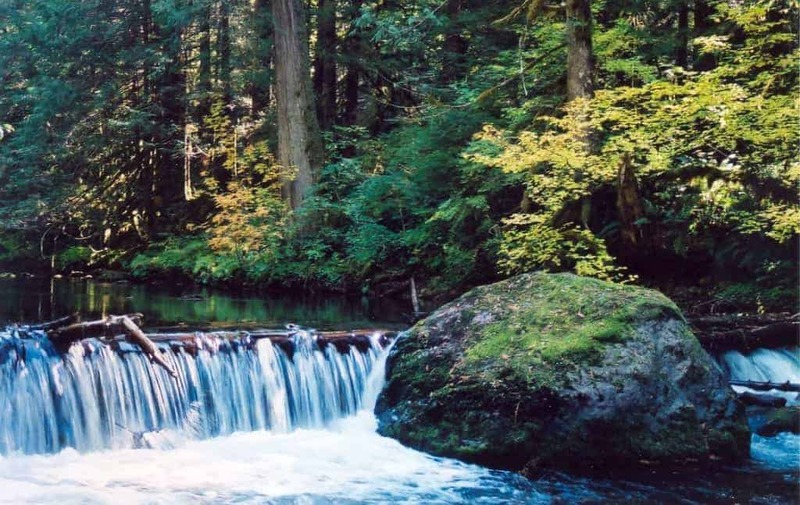 For many years, it was known to those who don’t fish as “that river along Highway 6 on your way to Tillamook,” but with a trail and a forest center now in place, plus a healthy forest making a comeback after catastrophic fires, the Wilson is a destination all its own. From the top (east end), the section from Elk Creek to Kings Mountain is usually done as part of the heinous Elk-Kings Traverse, but there are some nice meadows a half mile up from Kings Mountain trailhead. The next section down, Kings Mountain to Jones Creek, is the highest, toughest section. Jones Creek to to Footbridge, is the most popular section, owing to its ease of access, lack of big hills, and proximity to the river. Footbridge to Keenig Creek is a lonesome stretch with one big hill but lots of cool scenery. Got some favorite fall colors hikes I missed? Post a comment below to let me know! Follow me on Twitter (@60HikesPortland) or like the “60 Hikes” page on Facebook.